As lead guitarist for Quicksilver Messenger Service, John Cipollina helped create the psychedelic sound that was a hallmark of San Francisco music scene in the 1960s. The group's long instrumental jams, in which Cipollina played a central role, were legendary, both on stage and on record. Some of John's legendary equipment is on display at the Rock and Roll Hall of Fame and Museum. 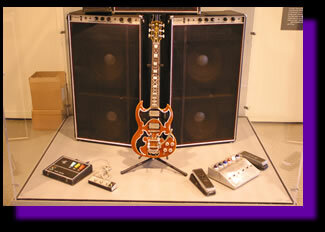 To create his distinctive guitar sound, Cipollina developed this one-of-a-kind amplifier stack. All of his guitars, including the one here, were wired with two pickups, one for bass and one for treble. The bass pickup fed into the two Standel bass amps on the bottom of the stack. Each Standel was equipped with two 15-inch speakers. The treble pickups fed the two Fender amps-a Fender Twin Reverb with two 12-inch speakers and a Fender Dual Showman- that drove the six Wurlitzer horns. "I like the rapid punch of solid-state for the bottom, and the rodent-gnawing distortion of the tubes on top," Cipollina said. 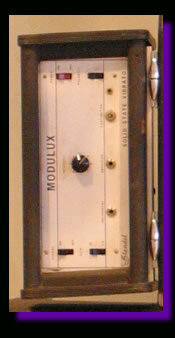 Cipollina used a custom foot-switched system to select reverb, tremolo, Astro Echoplex (the unit mounted on the right of the Twin Reverb), Standel Modulux (on the left of the twin reverb) or the horns. Truck running lights indicated which effect was being used. Cipollina also employed a Gibson Maestro Fuzz and Vox wah-wah and volume pedals. Rock and Roll Hall of Fame and Museum - Located in Cleveland, Ohio the Rock and Roll Hall of Fame and Museum is dedicated to exploring the past, present and future of the music and the cultural context from which it emerges. The Museum augments its own collection of thousands of artifacts with items on loan from artists and collectors from around the world. In addition to these items, the Museum's exhibits utilize film, video, interactive kiosks and, of course, music. 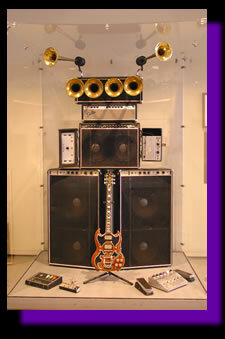 Besides his amplifier stack, one of John Cipollina's custom designed Gibson SG guitars is included in the display. In addition some of his pedals, including his custom control pedal are on display at the Rock and Roll Hall of Fame and Museum.